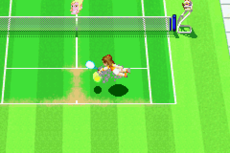 The Running Save is a Defensive Power Shot that Clay and Ace can use in the game Mario Tennis: Power Tour, and is also a Power Shot that is used by Roy, Whisker and Emi, making it (along with Quick Save, Quick-Step Save and High-Power Shot) one of the most frequently used Power Shots in the game. It is unlocked after gaining L1 Speed, meaning that it is one of the earliest shots to be able to be obtained. Upon activation, the user will run towards the ball and return it to the opposing side of the court. The Superswift Save can be considered an enhanced version of the Running Save as it has similar effects and can reach shots that are a larger distance away. "A save that can save the ball from a short distance away." This page was last edited on August 30, 2017, at 17:42.